Yes I don't know how you do it ALL!!! That rug is so gorgeous!!! And that umbrella holder is fab! Thanks Leah! I hope you're well. Hey Elissa, I'm in Canada and purchased it at Real Canadian Superstore. Looks gorgeous!! i must go out and hunt for it! Well, time to pack up the kids and make a trip to Superstore :) Thanks Erica! This IS a terrific find Erica! And it looks fantastic with your wood floors :-) I think I'll be making a trip to the Superstore this weekend!! Love your umbrella holder too! SuperStore continues to have some great house stuff, eh? Fab! what a find! so happy you popped back in. I don't know how you do it Erika!! I feel the same way about blogging, there's sometimes just not enough time to do it all with a full-time job and taking care of a baby. I commend you for doing it with 5! You go stylish mommy! What? My Superstore doesn't have that rug. Must start stalking now! Love! Glad your are back, you were missed! ooo well thank you for sharing my dear! Hope you enjoy the weekend with your handsome boys! Erica that rug is just perfect!! Love it! Come and enter my very fashionable giveaway! 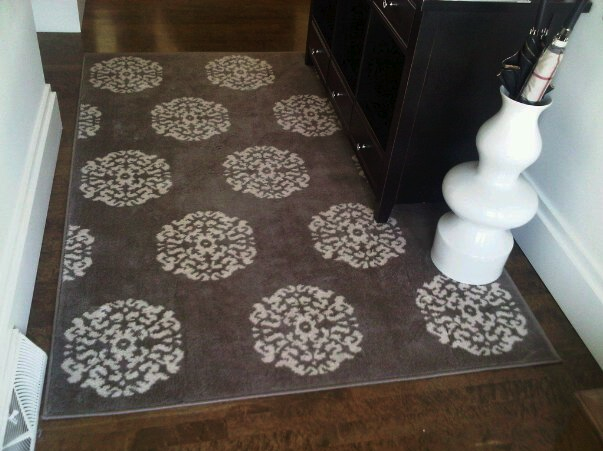 Thanks for posting this - I've been looking for a stylish rug for my entryway that is within my budget. Great find! What a great find...love it! We missed you!! And wow what a fantastic find. I love it!